After resisting viewing Justin Bieber: Never Say Never for many months no matter how many people encouraged otherwise, the inevitable happened (thanks to Netflix Instant). 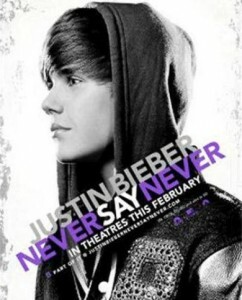 Never Say Never is a tour documentary and pseudo Justin Bieber biography complete with interviews from not only his family, but also his road crew, management team, celebrity friends and even close childhood friends. Worried about the amount of screaming girls and over-the-top bubble gum pop music about to be experienced, caution was taken upon pressing play on the remote. While the live scenes were jam-packed with over zealous fan girls – the documentary shed light onto aspects of Justin Bieber, the musician, the casual observer would not know. For instance, were you aware that Justin Bieber was given his first drum set at the age of 4 (and is actually a rather talented drummer)? Drums are only a part of Justin’s repertoire though, as he’s also a pianist, guitarist, vocalist and picked up some killer moves from mentor, friend and A&R “scout” Usher (yes, grammy-award winning R&B artist Usher). You also might not have known we owe Justin Bieber’s mainstream success to the power of social media. It’s true! Justin was discovered from a few YouTube videos he had posted that had gained quite a bit of attention. In fact, the only thing Never Say Never doesn’t really touch on is the songwriting itself. The Justin Bieber song catalogue is chock-full of boy-ish lyrics about love and lust, a category a young Bieber doesn’t seem to be qualified to know much about. The DVD itself offers several treats for the Bieber-obsessed fan and plenty of delectable factoids for the casual music fan and industry observer alike. Don’t take this the wrong way though, definitely not saying you’ll hear the High Voltage van blaring Justin Bieber’s latest CD down the street now… But this journalist can pay respect to an artist when it’s well-deserved. You go, boy.